Did you know that the smell of cinnamon is an aphrodisiac for human males? Worthy science if you ask me! After learning this my sister (Acadia - we're working on her Biscuit moniker - Biscuit Baby?) and I decided to use this random factoid to our Valentine's Day advantage. This year we're forgoing the card or getting dolled up for a crowded night on the town. We're going to let the Cinnamon Rolls do all the work for us. 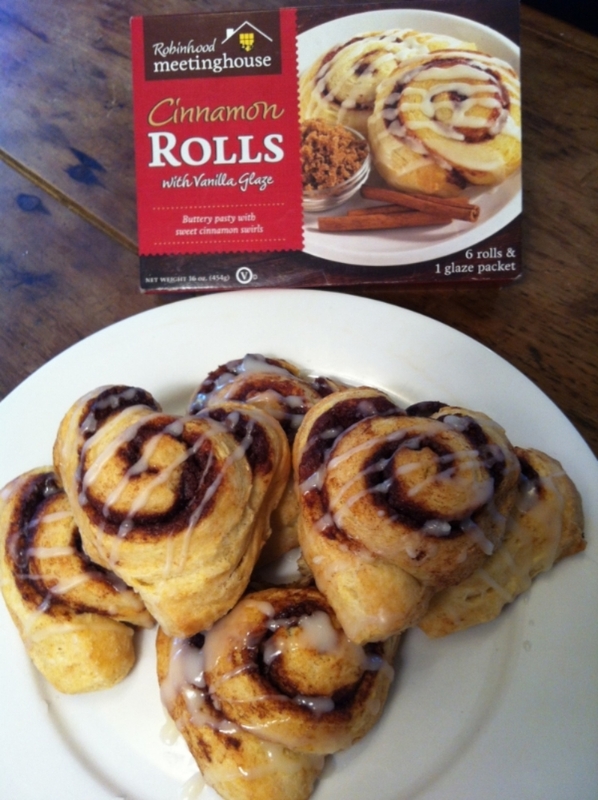 Enter Cinnamon Rolls Hearts. Easy, adorable, and they smell better than oysters! First - purchase (or win here!) a box of Robinhood Meetinghouse Cinnamon Rolls. Pop them out of the box and let them thaw for about 15-20 minutes, until the dough is flexible. (Sorry this picture is blurry). Now use your fingers to form the rolls into a heart. Gently press the roll a bit flatter, this makes it easier to form. It makes sense to use the little "tail" as the heart point. Use your pointer finger to make an indentation into the top and squeeze the sides upward with your other hand. These Cinnamon Rolls puff outward so you have to make a very exaggerated pointy heart. They will become much rounder while baking. Please remember - you can't hurt them - and they will taste delicious no matter what you do! Bake for about 10 more minutes. Drizzle on the vanilla frosting and serve. Have fun and happy Valentine's Day!